Bill “Boo” Haughton of Fallin first qualified as a miner in 1970, and went on to train as a developer and driver, opening up new coal seams, and in the specialist work of the Mines Rescue Service. 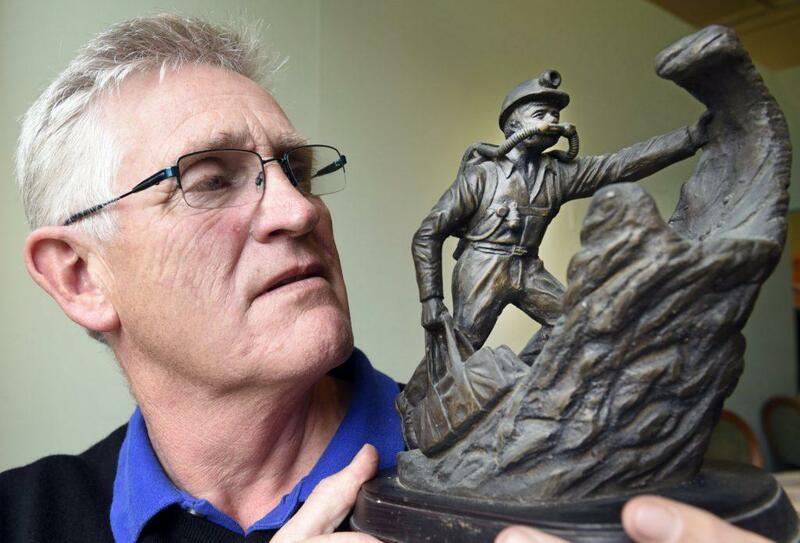 He was photographed by John McPake at the opening of the Battle for Polmaise exhibition at the Stirling Smith last week, with his mines rescue trophy. The trophy is one of a number of items loaned by Boo to the exhibition. Other items include photographs and his National Coal Board donkey jacket, the back of which is marked “Boo 953” – his nick name and his colliery number. NCB jackets were once commonly worn by Fallin miners working in Polmaise Colliery. Now they are as rare as the pit towels loaned by Mary Rennie and the spoon, loaned by Martha Benny. Her son Neil C Benny, now Depute Leader of Stirling Council, thought the special spoons were his, and he was known as “Little NCB” when a child. Dennis Canavan, who opened the exhibition, gave a graphic description of the working conditions in Polmaise and questioned if anyone today would believe or tolerate these conditions – the noise, heat, water, dirt, narrow seams and the constant, ever – present, danger. Boo’s name and number on the back of his jacket would have identified him after a fatal accident.